In project SHIRE (Seismogenesis at Hikurangi Integrated Research Experiment), we aim to rigorously investigate the feedbacks between plate interface slip behavior, solid and fluid mass fluxes, and manifestations of plate boundary mechanics in the long-term geological record that likely reflect common driving processes linking forearc uplift, sediment transfer and underplating, plate boundary strength, and seismogenesis. We will address this important problem through an integrated approach combining large-scale seismic imaging, paleoseismology, and geomorphology, focused through the lens of state-of-the-art numerical modelling. 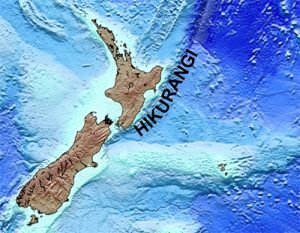 First, we will investigate present-day to long-term (>10,000 years) deformation styles of the Hikurangi margin by integrating paleoseismological studies with ongoing geodetic modeling. To characterize the physical attributes of the subducting Pacific plate and the North Island forearc, and the influence of these on plate interface slip behavior and long-term forearc deformation, we will collect seismic reflection and refraction data onshore and offshore New Zealand. Marine and land-based active-source seismic data will show the crustal structure of the incoming and overriding plates and subduction thrust character from the trench to the mantle wedge corner. The new constraints on physical properties and deformation will be integrated via a suite of numerical modeling studies that test a set of focused hypotheses explaining controls on subduction thrust slip behavior and long-term margin evolution. The physical processes dictating the spectrum of fault slip modes (spanning destructive earthquakes to slow slip events and aseismic creep) and the links between these behaviors and long-term morphotectonic evolution of subduction systems are not understood. There is a fundamental need to address this important problem with an integrated, system-level approach combining geodynamical modeling with high-quality geophysical and geological constraints on subduction margin characteristics. We will test the following hypotheses in this project: 1) High fluid pressure on the megathrust reduces effective normal stress, promoting stable sliding and/or failure in repeating slow slip events; 2) Rough subducting seafloor promotes aseismic creep associated with heterogeneously distributed pore pressure, stress, and frictional behavior along the plate interface; 3) Subduction of thickened Hikurangi Plateau crust drives both long-term uplift of the forearc and increased normal stress across the plate interface; 4) Both the locations of slow slip events and forearc uplift are related to underplating of sediment to the lower crust of the overriding plate; and 5) The distribution of stick-slip versus creep behavior persists through many seismic cycles. The existing data show along-strike trends in the structure and behavior of the Hikurangi margin that make it the ideal location for such a quantitative analysis of physical controls on the short- and long-term dynamics of the Hikurangi system. Meet the researchers working on this proposal. Follow along with the SHIRE team on their expedition blog. Go back to the main Hikurangi Subduction Zone Seismic Studies page.